Divided Sovereignty is a lucid piece of work that makes a coherent argument in favor of a pluralist conception of multilateral institutions, which would serve as the agents of peoples and, as a last result, protect peoples against fundamental violations of human rights. Pavel provides a systematic and thoughtful account of the reasons why coercive international institutions are needed, the nature of their authority, and why individuals should support them and states should comply with their rules. Her book is a valuable contribution to the nascent shift in theorizing about global justice toward taking institutions seriously. 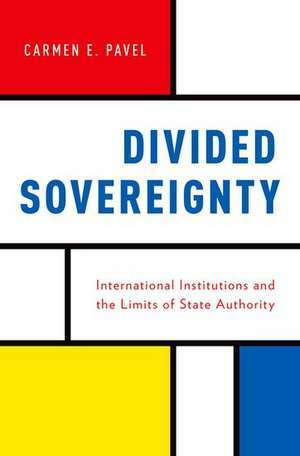 Divided Sovereignty makes a compelling case for supplementing sovereign states with coercive international institutions. Though it shares a concern for global justice, the book presents a powerful alternative to the institutional visions typically outlined by cosmopolitans. By prioritizing good institutional design over abstract morality, and defending the importance of collective self-determination, Pavel reorients recent debates. This is an original andimportant book. Carmen E. Pavel is a political theorist who specializes in contemporary political philosophy and the history of political thought. Her interests include liberal theory and contemporary challenges to it, ethics and public policy, international justice, the authority of international institutions, and environmental ethics. She is Lecturer in International Politics and Director of the BA in Philosophy, Politics, and Economics (PPE) Programme King'sCollege London.